I love to see all of you, devs, packagers or just curious on the Bacula developer conference held in Yverdon-Les-Bains Switzerland on September 26, 27 & 28. You don’t know what bacula is ? Well I would summarize it as an one of the essential component in enterprise IT. It not only backup your data, it give you them back when needed ! Don’t smile, many backup solution failed (even proprietary solutions) in this last crucial point. Here’s the program extracted from our mailing-list. Want to learn about and help define the Bacula roadmap. Want to give feedback or ideas directly to the developers. Airport) on the 27th and 28th of September. If you arrive on Sunday the 26th there would even be a chance to meet most of the Bacula Systems founders in person. Naturally, we will furnish plenty of beer and pizza and other goodies. Last years election of seats for the openSUSE board showed that our election rules are not complete. So, before the elections this year start, I propose that we refine the rules and like to start with this post a discussion on how to change them. We also need to clarify when the new board constitutes. We should have a light weight process that is not overly complex and results in endless votes. We vote for people that volunteer their time for the openSUSE project and don’t get any material benefits for it. So, let’s keep that in mind when discussing alternatives. 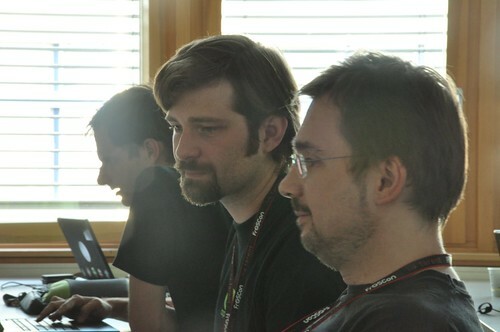 Back home in Nuernberg now – Sunday has been a long day of hacking on Elgg and its plugins to shape it into a users site that knows about the social side of the openSUSE community. Our ‘Hack Meck’ was a little bit harder after letting loose at the legendary FrOSCon Saturday night party in the balmy August air, but we still managed to put down the glow sticks, hammer the keys and reach our goals for the weekend. These were adapting the user data to include fields that are peculiar to openSUSE such as membership status and IRC cloak, enhancing the Poll plugin to meet our info gathering needs, adapting the Elgg theming to our ubiquitous Bento theme, and working on calendaring and events so that we all know what is coming next in openSUSE world and so you can display your packaging and bug-reporting achievements to the world. 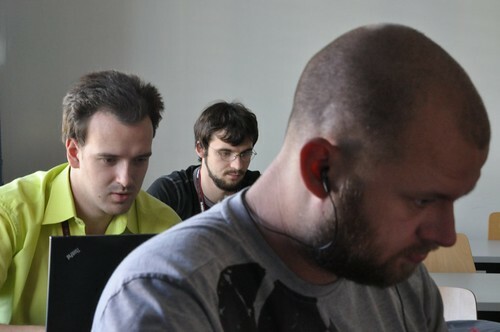 When we weren’t making like a bunch of web developers, we mingled in the exhibition area, presented our project to anyone who came by the Hack Meck room and generally enjoyed seeing the diverse projects that come to FrOSCon. Thanks go to the FrOSCon organizers for making us so welcome and to the openSUSE booth staffers for doing a terrific job – we look forward to doing it again next year. After long drives from Nuernberg, Prague and Darmstadt hitting every traffic jam on the A3 (the Czechs won the race), the openSUSE Boosters met up in the little rhenish town of Sankt Augustin near Bonn to attend FrOSCon. Last night we reacquainted ourselves with each other and the odd glass of Kölsch or two over steak and chips. 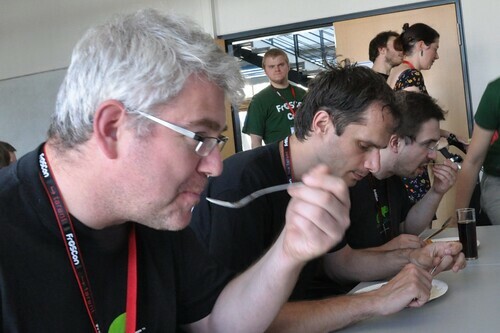 Suitably fortified, we are now occupied our project room upstairs at FrOSCon (room C125) and are now hacking like crazy on our team project, a new site for openSUSE users and contributors. 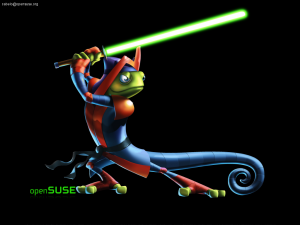 This is based on the Elgg free software social networking platform, so we’re dusting off our PHP and looking at all the integration points with the rest of the openSUSE platform: the Build Service, Bugzilla, the wiki, Lizards, and so on. So if you’re more of a web monkey than a distro gibbon and would like to help, drop by tomorrow or just get in touch with the ﻿﻿﻿﻿﻿﻿http://en.opensuse.org/openSUSE:Boosters_team. I’m off to the social event now, more tomorrow! Ah, FrOSCon, where all the projects with funny capitalisation feel at home, and they promote OSC, the Open SUSE build service Command line tool for us. 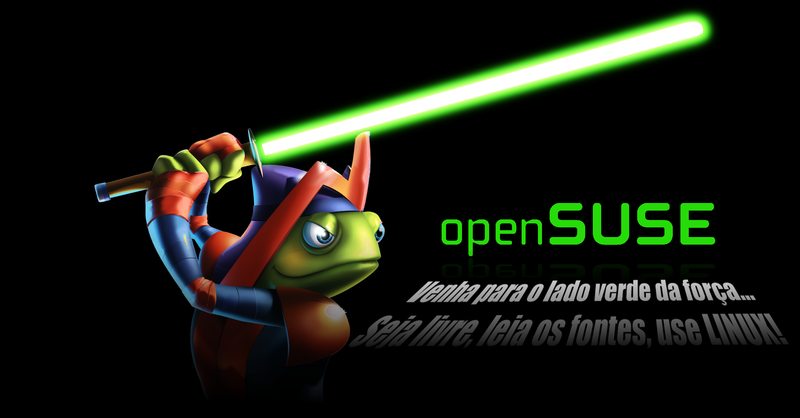 I’m going to be there together with the other openSUSE Boosters, where we have a Devroom to hack on things that will make openSUSE go Pop! (in the swelling-with-contributors sense). If you’re at FrOSCon, be sure to drop by and say hi! Oh and we will have the latest KDE stuff to show you, as usual :).